Imagine you’re in a new country. You’re still learning the language. You’re trying to figure out who runs things. You don’t have a lot of money. Meanwhile, however, you see things that aren’t fair and need to be changed. What do you do? Most of us in that situation would be overwhelmed…lost…disgruntled. But Maria “Elvia” Salazar took classes to learn as much as she could—and began lobbying. Because Elvia isn’t afraid to speak up, others are brave as well. 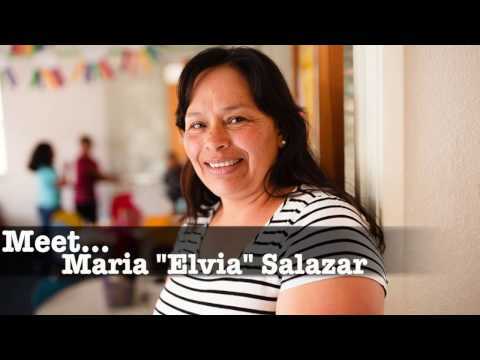 At her own housing development, Elvia has dramatically increased resident participation at tenant meetings and other events. Salazar first came to the United States from Mexico 11 years ago, by bus with her 10-year-old daughter and 2-year-old son. They came to join her husband, who like so many others had traveled to the United States for a better income, harvesting lettuce, broccoli and other crops. Despite the lack of English language and her status as “new kid on the block,” Salazar immediately enrolled in a class offered by her children’s school, teaching parents new to the country how things work. She was a good student, and when she saw how other immigrants like herself worked so hard they began to forget about the traditions and customs of their home country, Salazar got involved. She joined groups at school and where she lived, affordable apartments developed by People’s Self Help Housing. She organized a traditional dance group, parties for Christmas and saints’ days, and an after-school and summer program for children. Teachers were invited too, and pretty soon, “they started asking when the next (event) would be,” recalls Elvia. But Salazar’s community engagement went way beyond social events and homework help. When the city decided to drop a bus route upon which many residents relied, she swung into action. She knew the number of riders was down at that time only because many residents had returned to Mexico during a break from their agricultural jobs. Salazar rallied the neighborhood, persuaded residents to sign a petition and show up at community meetings—and got the route reinstated. Another “epic battle” was fought by Salazar and her troops when the boundaries for the elementary school district were redrawn. This made the parents in Salazar’s apartments very anxious; their children would be bussed more than a mile away when a neighborhood school was within blocks. Salazar agreed to lead the residents, and mobilized the group to speak out at the next school board meeting. More than 60 parents attended, prepared by an organizer Salazar recruited to train the parents. Because of her commitment and the parents’ involvement, the board re-adjusted the boundaries for students who lived directly across the street from the neighborhood school. Because Salazar isn’t afraid to speak up, others are brave as well. At her own housing development, Salazar has dramatically increased resident participation at tenant meetings and other events. Members of the school board also have reported more active parents at board meetings. The force at work isn’t some effective advertising campaign or reward system. It’s called Elvia Salazar.